The word SKY‐CEIL™ is an acronym derived from the two words: SKY and CEILING. 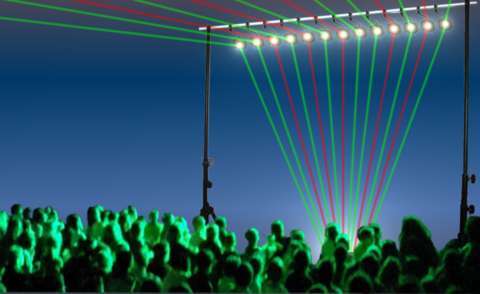 With this device, you are able to create a Ceiling of Laser Beams, generated by our Laser Harps, that are crossing the Sky above the heads of the people are attending your Show! It is designed to be used with the Laser Harps we craft. The flexibility of this device is very high. All the mirrors are adjustable in all 3 axis, permitting to create different shapes of the Laser Ceiling. The Horizontal Rod is tiltable, permitting diagonal effects of the laser beams, as well as a slightly curved parabola and so on. The limits in the effects are depending by your own fantasy. We are producing two types of SKY‐CEIL™: Sky‐Ceil 2 and 3. The difference is just the length of the horizontal Rod. It is long 2mt in the case of SkyCeil™ 2 and 3 mt in the case of SkyCeil™ 3. Both devices are reaching up to 3,10mt high. Despite the dimensions, the SKY-CEIL™ is fully transportable in a normal Car! It’s also quickly mountable and adjustable. It comes with two main stands, and the mountable horizontal rod. The single sections of the rod, use a very fast and secure method to be joined together. The manual explains how to quickly install and adjust the mirrors, in order to create various type of laser roofs. The principle of working is very simple and at the same time it gives a great effect. 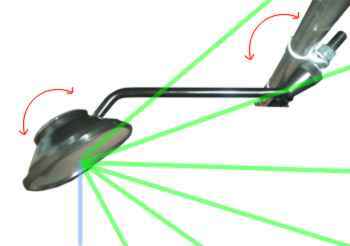 One of the reflection’s laws tells that the angle of the reflected rays is equal to the incident ray’s angle. So that the angle between the incident ray and the reflected ray is equal two times to the incident or reflecting angle. Setting each mirror at an angle of 45°, it reflects the rays from the Laser Harp, by 90°, creating the horizontal roof that everybody is expecting from SKY CEIL. The effect is exactly the same you can see in many movies about the concerts of Jean Michel Jarre. People can watch the laser beams over their heads and when you are breaking the beam, also the related one over the heads is broken, amplifying the movement of the musician’s hand. With Kromalaser SKY CEIL you dan do more than this. Indeed each mirror is completely adjustable on vertical and horizontal axis. More over the arm that support the mirror is also adjustable. With this feature, you can set up each ray with an angel and create an irregular roof, or a curved-ondular roof etc. creating spectacular shapes and avoiding to point the lasers directly on the public’s eyes ! The horizontal rod can be also tilted toward left or right obtaining a tilted roof that you can shape as you’re fantasy need in order to create more sensation in the people is attending your performance. SkyCeil is the ideal for any Laser Show/Concert with our Laser Harps.